Home / Local / Eye on Tactics: NYCFC dam breaks under DCU possession, crossing pressure. Eye on Tactics: NYCFC dam breaks under DCU possession, crossing pressure. Jason Kreis summed his team’s performance up after the match as NYCFC couldn’t withstand DC United’s 60.8% possession and 34 crosses. Kreis committed, once again, to a front six he has grown accustomed to as they pushed for a playoff berth. With injuries to key defensive players Facey and Iraola, the manager was forced to insert Mena and Allen, both no strangers to the starting XI. As has been the trend of late, Diskerud and Grabavoy were chosen to play wide in the midfield shape, but tasked with pinching, combining and keeping their space compact. The formation was originally defined as a 4-2-3-1, but shifted to 4-1-4-1, 4-1-3-2 and eventually 4-4-1-1. Ben Olsen’s DC United maintained his standard 4-4-2 medium block, populated by a standard lineup of players. Rolfe was originally paired with Espindola up front, but tended to sag behind the lone forward into a #10 pocket, thus creating a 4-4-1-1. In a flowing move down the right flank involving Diskerud, Jacobson, Villa and eventually Lampard, NYCFC shocked the home team with a quality, early goal. Immediately after, NYCFC displayed their pressing intentions with a medium-high block as Lampard horizontally paired with Villa in the press. Not only does this strategy limit the influence of DCU’s CDM Perry Kitchen, but sends a message of persistence and firm intention. 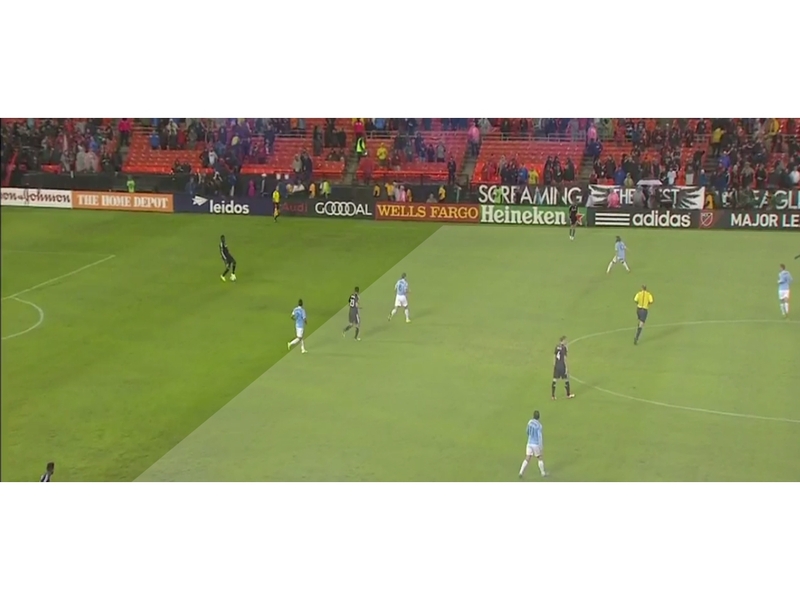 As the match progressed, even as early as 12′, NYCFC changed their line of defensive contact to almost midfield and applied a standard medium-block. This allowed DCU’s most influential player, Kitchen, to dictate the tempo and for the opposition to have much more of the ball in deeper spaces. The medium block was the dam that needed to be maintained and kept leak free if NYCFC was to come away with the victory, but it was all too much. NYCFC allowed DCU to possess the ball higher up the pitch, and it often lead to a whipped in ball from the wide defender. DCU had 34 attempted crosses in the match, stemming from the deeper distribution positions that were being allowed. The deeper NYCFC sagged into two blocks of four players (in their defensive and midfield blocks), the more isolated Villa became. 72% of DCU’s attack came from the flanks as they quickly identified Allen and Wingert as weaknesses they could exploit. DeLeon and Kemp frequently isolated Allen wide and were able to send six crosses, as Pontius and Franklin had their way with Wingert on the opposite flank as well, sending six crosses. The ball spent 74% of it’s time in the midfield or NYCFC’s defensive third. As DCU maintained almost 61% possession, NYCFC had to spend a lot of time defending and it took its toll. Both of DCU’s goals came in the last 20′ of the match, and both were the likely results of tired, over worked bodies. The first being a poor rebound given up by Saunders off of a 20-yard shot, compounded by the unwillingness of Allen to track a forward after the shot was taken. The second? An abysmal clearance attempt from Jacobson off of a DCU free kick, the potential product of not having anything left in the tank. If NYCFC was able to capitalize on any of their few, full offensive chances, the story line of the end of the game would have been drastically different. The highlighted .GIF above is an example of not only the struggles of NYCFC’s consistent, final product, but of variety of quality that their players bring to the table. David Villa expects a ball 5-6 steps and three touches before Allen provides it: a microcosm of the balance of overall player quality the team must address in the off-season.